With the globalization of work and technological advancements in recent years, and with emphasis on service quality today, organizations have changed. Virtual work has emerged as the new employment relationship and has been embraced by employees and employers in many industries. This book explores the dynamics of changing organization structures, theories of leadership and trust, and how dimensions of self-efficacy works in this new work relationship. 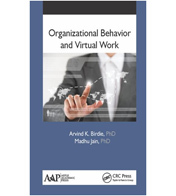 Organizational Behavior and Virtual Work: Concepts and Research shows the enormous impact of technology and globalization on employment relationships and also predicts how they will contribute to the changing dimensions of organizations in the future. With a unique blend of theory and application in the real world of virtual workers, the book presents the most recent research and developments in the relatively new and still emerging area of virtual work. It takes an in-depth critical look into the key factors affecting the virtual work environment with practical inputs of suggestions and recommendations. With the objective of presenting information about this new work scenario, this book attempts to unfold important human behavior processes in organizations. The volume presents a rare combination of the necessary concepts of human behavior in organizations along with the results of research in the field and also makes practical recommendations on virtual work programs.